Are you Overgramming? Instagram is stepping up to help you manage overuse rather than leaving it to iOS and Android’s new screen time dashboards. Last month after TechCrunch first reported Instagram was prototyping a Usage Insights feature, the Facebook sub-company’s CEO Kevin System confirmed its forthcoming launch. Now we have our first look at the tool via Jane Manchun Wong, who’s recently become one of TechCrunch’s favorite sources thanks to her skills at digging new features out of apps’ Android APK code. Though Usage Insights might change before an official launch, these screenshots give us an idea of what Instagram will include. We’ve reached out to Instagram for comment, and will update if we hear back. 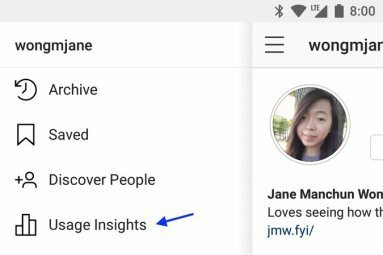 This unlaunched version of Instagram’s Usage Insights tool offers users a daily tally of their minutes spent on the app. They’ll be able to set a time spent daily limit, and get a reminder once they exceed that. There’s also a shortcut to manage Instagram’s notifications so the app is less interruptive. Instagram has been spotted testing a new hamburger button that opens a slide-out navigation menu on the profile. That might be where the link for Usage Insights shows up, judging by this screenshot. Instagram doesn’t appear to be going so far as to lock you out of the app after your limit, or fading it to grayscale which might annoy advertisers and businesses. But offering a handy way to monitor your usage that isn’t buried in your operating system’s settings could make users more mindful. Instagram has an opportunity to be a role model here, especially if it gives its Usage Insights feature sharper teeth. For example, rather than a single notification when you hit your daily limit, it could remind you every 15 minutes after, or create some persistent visual flag so you know you’ve broken your self-imposed rule. Instagram has already started to push users towards healthier behavior with a “You’re all caught up” notice when you’ve seen everything in your feed and should stop scrolling. I expect more apps to attempt to self-police with tools like these rather than leaving themselves at the mercy of iOS’s Screen Time and Android’s Digital Wellbeing features that offer more drastic ways to enforce your own good intentions. Both let you see overall usage of your phone and stats about individual apps. iOS lets you easily dismiss alerts about hitting your daily limit in an app but delivers a weekly usage report (ironically via notification), while Android will gray out an app’s icon and force you to go to your settings to unlock an app once you exceed your limit. For Android users especially, Instagram wants to avoid looking like such a time sink that you put one of those hard limits on your use. In that sense, self-policing shows both empathy for its users’ mental health, but is also a self-preservation strategy. With Instagram slated to launch a long-form video hub that could drive even longer session times this week, Usage Insights could be seen as either hypocritical or more necessary than ever. New time management tools coming to iOS (left) and Android (right). Images via The VergeInstagram is one of the world’s most beloved apps, but also one of the most easily abused. From envy spiraling as you watch the highlights of your friends’ lives to body image issues propelled by its endless legions of models, there are plenty of ways to make yourself feel bad scrolling the Insta feed. And since there’s so little text, no links, and few calls for participation, it’s easy to zombie-browse in the passive way research shows is most dangerous. We’re in a crisis of attention. Mobile app business models often rely on maximizing our time spent to maximize their ad or in-app purchase revenue. But carrying the bottomless temptation of the Internet in our pockets threatens to leave us distracted, less educated, and depressed. We’ve evolved to crave dopamine hits from blinking lights and novel information, but never had such an endless supply. There’s value to connecting with friends by watching their days unfold through Instagram and other apps. But tech giants are thankfully starting to be held responsible for helping us balance that with living our own lives.